Nottinghamshire make the short journey down the A52 to Derbyshire and into uncharted territory, with Derbyshire sitting top of the Northern Group and the Outlaws sitting in 5th. The Outlaws need a result to get them back into the top four and the quarter final spots. If you had asked any pundits, or even Derbyshire fans, if this would be the position the teams would find themselves in at this stage of the competition, it would have been a very brave or perhaps deluded man who would have predicted what has happened. Derbyshire have been a revelation in T20 cricket this season, however, and have won 6 of the nine completed games they have featured in. Their batsmen have scored runs for fun and their bowlers have kept it as tight as you can in the modern T20 game. Derbyshire will be looking to back up their impressive victory over Yorkshire last night, which moved them to the top of the group after chasing down 181 at Headingley, and to cement their place at the top of the group before the break for Championship cricket to return. 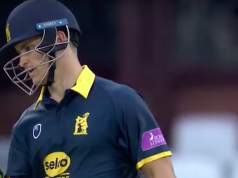 The Outlaws have won four of their seven completed games, but those games have been an absolute masterclass in T20 batting, with Hales and Wessels opening for the Nottinghamshire side. They have been devastating to opposition attacks, and have taken games away from sides in the blink of an eye. The visitors will be hoping for a repeat of the previous meeting between the two sides, where they triumphed by just five runs at Trent Bridge. The bookies believe that Notts are clear favourites to do this and, if you look at the squads you can see why. Derbyshire are top of the group for a reason, however, and it’s not by accident: they have been playing excellent cricket. Whenever I write a preview I always say “If I were a betting man”. Well, tonight I might be and my money would be going on the Falcons for a victory. When you watch Derbyshire there is always one man who stands out, and that man is Wayne Madsen. He is a picture of consistency and, if he doesn’t score runs, then run for cover as the game may be followed by the arrival of the four horsemen of the apocalypse. He is vying to be the first Derbyshire batsman to score four half centuries in a campaign and is just one away, after scoring 49 and 43 in his last two innings. This season has also seen the emergence of Wayne Madsen as a key part of the bowling attack. His bowling has really improved and his ability to keep it tight, and often take a vital wicket, is a lovely asset for his skipper. If Madsen can fire tonight for Derbyshire, then a victory is within their grasp. In a team of international superstars it is easy to have your eye drawn to Hales, Patel and Gurney. However, for me the man most key to Notts’ success is Steven Mullaney. 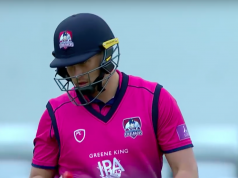 Mullaney very rarely gets the credit he deserves His middle order batting is brutal and he can clear the ropes, but he judges situations well and when he needs to accumulate runs instead he does. His bowling is also a real weapon. He takes wickets and keeps the run rate down with his nagging medium pace. He is a genuine all-round cricketer, who consistently performs and is central to the Outlaws’ success not just in this match but in every game. Derbyshire will again be without Matt Critchley, who is side lined due to the blow he took to his head in the Leicestershire game. He is replaced in the squad by Gregg Cork. Despite this, I expect Derbyshire to name an unchanged side from the one that defeated Yorkshire last night, so Tom Wood should make his second appearance of the season and the ones to miss out will be Cork, Broderick and Quadri. The Outlaws have their battery of internationals available to them with Hales, Patel, Taylor, Christian, Gurney and Sodhi, who will give them fire power with bat and ball. 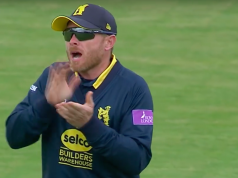 The batting has fired for the Outlaws this season, and I see no changes in the batting line up, so a top three of Hales, Wessels and Moores should remain the same, as should the rest of the side from the last completed game over Yorkshire. The weather looks set fair for the game tonight with no chance of rain, so leave your umbrella and waterproofs at home. The pitches at Derby have generally offered more runs than Vernon Philander at the Oval last week, however with the amount of rain that has fallen in Derby over the last week, the pitch will have been under the covers for more time than the Groundsman would have liked. The last game at Derby saw a slower and stickier pitch, because of this, and slightly fewer runs, so tonight should see a great contest between bat and ball.